The wonderful selection of floss I received from DMC Creative has given my embroidery and design work a huge impulse this year. 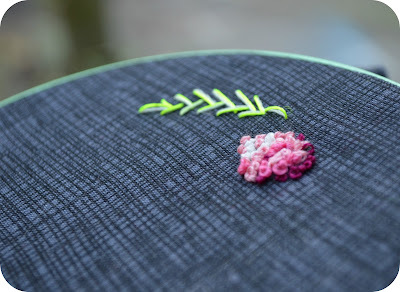 I think it helped and inspired me to refine my design style and embroidery techniques. 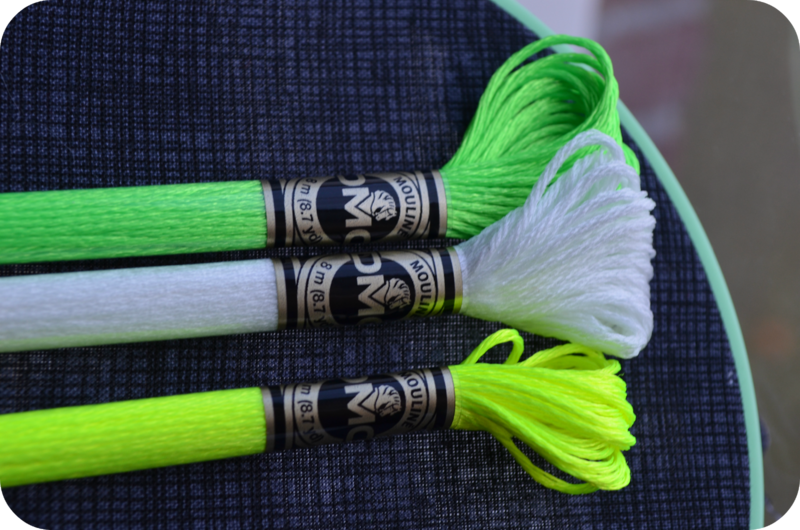 The label on the yellow and green floss says Fluorescent Effects. The light coloured floss in the middle is Glow in the dark floss. Now these are not colours or flosses that I would normally go for but at the same time I'm kind of drawn to them as well. I always like to try new things, so today I thought I would just go and try the 'crazy flosses' out on a free form embroidery type of thing. In a stroke of genius (ahem..) I chose this dark charcoal coloured cross hatch fabric. A perfect backdrop for the bright colours I think. I have only just started but the first thing that really impressed me was how soft the Glow in the Dark floss feels. I have a set of other Glow in the Dark floss that feels hard and is difficult (read: near impossible) to make neat stitches with. This particular floss feels more like Satin Floss (or the old DMC Rayon Floss) so it's a little silkier than your regular six strand floss. Even making French Knots was not a problem at all. The Fluorescent flosses were equally easy to handle. 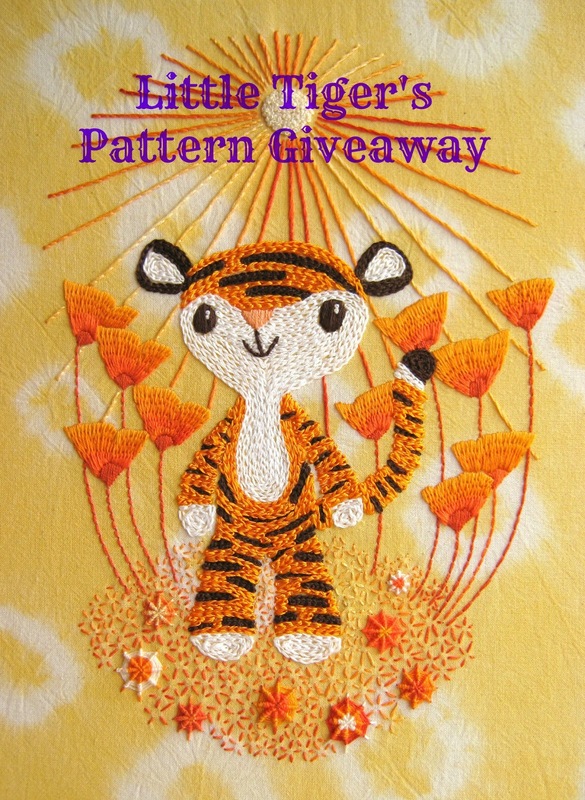 Thank you to all who left a comment on my most recent giveaway. I so enjoyed reading about your favourite tree ornaments. 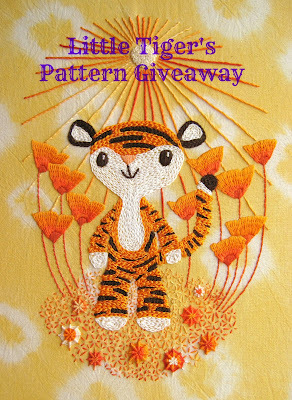 :) Winner of the totally adorable Little Tiger pattern from Joey's Dreamgarden is commenter no.3 which is Em. Congratulations Em! If you are looking for a cute and beautifully handmade gift a visit to Joey's shop is a must. 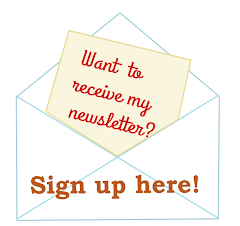 & thank you Joey for contributing to my 500th blog post celebration! I think it's going to look amaxing, so I want to see it at the end no matter what it looks like. I really like the idea of adding some of those glowing white in the midst of the pinks - I can imagine it all pretty and feminine and then the lights go out and you end up with a glowing impression of the picture left behind. Thank you for sharing your experience Annette! Are you sure these were DMC fluorescent threads that were bleeding? In my experience DMC threads are v colorfast!